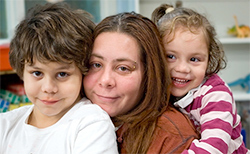 The SHIFT (Service and Housing Interventions for Families in Transition) study examined the effectiveness of emergency shelter, transitional housing, and permanent supportive housing in establishing and maintaining residential stability and self-sufficiency for families in four communities in Upstate New York: Albany, Syracuse, Rochester and Buffalo. Interviews were conducted at program entry and follow up interviews were conducted 15 and 30 months later. Mothers answer questions about their children, their housing and employment history, their health and mental health, challenges they have faced, their receipt of services and public benefits, and their accomplishments. A study of long-term outcomes for families entering shelters and other housing programs found that more than half still didn’t have stable residences after 30 months.